Pasadena, CA - On June 10, 2010, Fuller Theological Seminary (Pasadena, CA) hosted an event entitled, “Residents of Heaven: An Exhibit of Byzantine and Modern Orthodox Icons.” This special event featured several profound icons which were crafted by the renowned iconographer, the Very Reverend StamatisSkliris. Exhibit 2010The event commenced within the David Allan Hubbard Library, and was sponsored by TheodorosVeniamis, of the Western American Serbian Diocese. With the Fuller pre-graduation ceremony taking place the very next dayand new students roaming throughout the library anticipating their upcoming summer session, this exhibit brought a sense of serenity for many. Lynn Reynolds, who helped organize the event, stated that "it was so wonderful for the students to come down the stairs [inside the library] from the weariness of their day and see the walls adorned in beauty.” Indeed, the beauty adorned upon the walls is a reflection of Fr. Stamatis’s love and zeal for Theology and Art, which has defined him as one of the most knowledgeable Orthodox iconographers. Saint Justin of Chelije similarly added that “brother Stamatis has long ago taken place on iconostas of Christ-like iconography and Christ-centered iconology of Orthodoxy”.Succinctly put, whether on paper, canvas, wood, wall, stone, or metal, Fr. Stamatis’siconsare a living testimony to the reality that God became man and dwelt among us (John 1:14-16). This foundational reality of Christianity attracted an audience of those both old and new to the faith. As the crowd began to mount around the icons which were precisely mounted by JimmyGabrie, Lynn Reynolds and the staff of the Fuller Library, Dr. William Dyrness (Director of the Visual Faith Institute, Brehm Center for Worship, Fuller Seminary) began his opening address. Dr. Dyrness respectfully introduced Fr. Stamatis, as well as the main guest speaker, His Grace, The Right Reverend Bishop Maxim of the Western American Serbian Diocese. Bishop Maxim focused his discussion upon (1) the existential relationship of icons to the modern world and (2) the twelve special characteristics that characterize Fr. Stamatis’s icons. In the first address, Bp. Maxim spoke about the ‘otherness’ of icons. That is, an icon represents both a Person and a personal relationship. He went on to say that “one of the most significant points to emerge from the Seventh Ecumenical Council is that one Divine Person – the Son of God –became man, demonstrating that we cannot speak about God or imagine God without the Person who revealed God to us. An image that does not refer to the Person of Christ is an image that refers to the corrupted world and thus leads to death. The Icon is not of this world; it is eschatological both in origin and in content. Not being drawn from history, we can call the Icon meta-historical.” Quoting Saint Basil, His Grace pointed out further that “the honor paid to the Icon passes on to the prototype!” Secondly, Bp. Maxim emphasized how Fr. Stamatis is authentically post-modern. He explained that Fr. Stamatis employs purely artistic criteria; he does not adopt ready-made solutions from the iconographic past; he researches everything anew, and he combines strictly traditional elements with those that are modern; e.g., The Mighty Protectress (Theotokos) is strongly traditional, but Christ has the movement, the colors, and brush deposits of modern, expressionist art. Fr. Stamatis uses clear and strong colors, while a Byzantine lighting plays the most significant role. Fr. Stamatis looks at it in a neo-impressionist manner, i.e., he captures Byzantine light with brush strokes that emphasize dominant points in an impressionist manner. Furthermore, the look in the eyes of Fr. Stamatis’s icons are not only transcendent, as is the case with old icons, but they also have some special features which are applicable to modern man: (1) an intense look; (2) a look which creates a relationship with the observer-pilgrim; (3) a psychological look; (4) a look that thinks and examines. After Bp. Maxim’s introduction, Fr.StamatisSklirisindividually described the symbolism in several of his works. 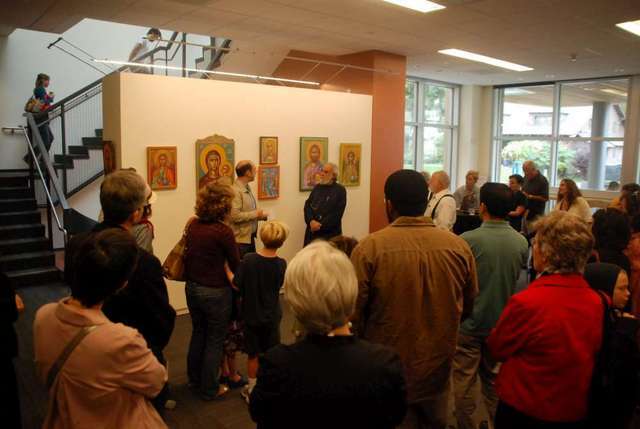 Highlights included his 1997 wooden icon, “Christ: the Same throughout the Ages” as well as an icon of St Mary of Egypt and Saint Zosimas, which was made in 2004.The presentation was followed by refreshments and informal dialogue. Father StamatisSkliris was born in Piraeus, the port of Athens, in 1946. At his baptism he was named after Holy New Martyr Stamatios from the island of Hydras. From the early childhood, he showed the artistic gifts and through his elementary and high school education, he began to paint and write church poems. Initially he completed the Medical faculty (1971), and then Theology (1976) at the University of Athens. He continues his studies in Belgrade at the Theological and Philosophical Faculty, attending lectures in Theology and Art History. His love and zeal for Theology and Art, defined him as one of the most knowledgeable Orthodox iconologos, iconographer and technotrope (designer and stylist) of icons, as well as of the ancient, medieval and modern art. If we could try to express in short the chief characteristic of Father StamatisSkliris as iconographer, then we would use the words of Abba Justin of blessed memory (to whom Fr. Stamatis painted recently a beautiful icon-portrait): “brother Stamatis has long ago taken place on iconostas of Christ-like iconography and Christ-centered iconology of Orthodoxy”. All his artistic, iconographic talent and activity of sacred art, of Incarnated God, man, God-created creation, which Father Stamatis based and developed on the Mystery of Christ – Son of God, Who is the Icon of Invisible God (Col. 1,15), Who became Son of Man through Incarnation, and thus appeared visible, describable, featured with colors and most particularly with the light – on a matter: paper, canvas, wood, wall, stone, metal. Christ’s Incarnation is the foundation and the key of Father Stamatis’ Orthodox iconography and paintings.